It is a cliche to say the world is moving fast. Fast markets, fast companies, fast technology, fast lifestyles. However, there is one type of fast that you need to keep your eye on, because it will change the way you work, who you work with and the skills you need to survive. I am talking about the agile organisation. 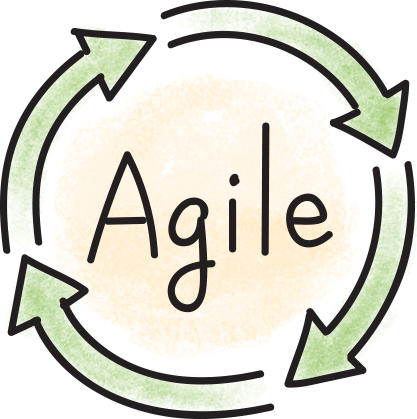 Agile is a way of working and delivering at speed and in a highly collaborative way. In project terms, it means getting people from multiple functions in the same location to work together, on a shared goal, for a fixed period of time. These are called sprints. Enterprises are changing their structures and roles so that working in this way is just day-to-day business. Enterprises are changing their structures and roles so that working in an agile way is just day-to-day business. In an agile organisation, design functions such as marketing, sales, product management, risk, technology, finance and R&D are effectively disbanded. Instead, squads of multidisciplinary teams work together to get stuff done. These squads are in turn organised into tribes. Your functional lines no longer control your expert grouping (for example, professional finance people) because there are no functions. Instead, your expertise is supported and developed by a chapter, which is sort of like a special interest group (but more disciplined). Some people will find this exciting; others will think it sounds like a disorganised mess. But it is far from disorganised. Real delivery objectives will be set by the team and progress tracked daily. In fact, progress to real customer and business goals will be far more efficient and visible. These are the attributes that are making this model attractive to organisations such as ING and ANZ, which have publicly committed to this agile approach. How ready are you for this? First, you will not be able to return to the fold of your functional team. You will be with your agile team for extended periods of time. So, working successfully outside your traditional grouping of colleagues is important. Furthermore, you will need to be comfortable with delivery transparency. Every day you will have to talk to your agile team (or squad) on the progress you made the previous day. Your tasks are placed on a visual board and moved as you make progress. Everyone can see how close you are to completion. Listening also means accepting feedback on your ideas and tasks in an open forum. This can take some getting used to because you cannot allow feedback to slow down your contribution. This listening implies a willingness to learn from the comments of your squad peers. On the upside, you will have opportunities to learn new perspectives and skills more quickly than in any other modern form of organisation. Those who see this as an opportunity will be best positioned to thrive. The nature of leadership in an agile organisation is different. It is much less about directing and co-ordinating, and much more about goal setting and collaboration. This means adopting a management style best described as servant-leadership, where your role as a leader becomes more focused on finding ways for others to be successful. Beyond the day-to-day delivery cycle you will need to take even stronger ownership of your professional development, because you will no longer report to a functional expert. You will meet regularly with members of your chapter. You will have a chapter lead, but they are likely to be fulfilling the role on a part-time basis because they will also be in squads. However, they will endeavour to work with you on your development plan and facilitate appropriate training as required. Working successfully outside your traditional grouping of colleagues is an important element of the agile workplace. Finally, you might need to feel comfortable with change that goes well beyond the usual functional model. While functions restructure regularly, it is likely you will change squads, or squads will be reconstituted more often than the more traditional organisational restructure. This is because squads are there to meet objectives, and as objectives are fulfilled (or changed) there will be a drive to reform squads around the next priorities. Expect to be a member of many squads as you progress through your career. So, how do you test whether you have what it takes to succeed in this emerging environment? One way is to volunteer to join agile projects to get used to this new way of working before it becomes the normal way of working. After all, while the agile organisation might be relatively new, the adage practice makes perfect still applies. Roger Perry is managing director of Bevington Group. This article was initially posted the Australian Financial Review. This entry was posted in Uncategorized and tagged Adaptability, Agile, Performance Culture.